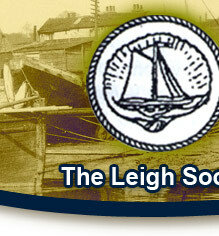 This is a just a very quick review of some of the highlights of Leigh’s history – there is much more to learn and the Society is always willing to help researchers wherever it can. Leigh was mentioned in the Domesday book as Legra. The entry describes Leigh as being held by 1 freeman as a manor and as a hide (measure of land) and having 2 villeins (a tenant who occupied lands on condition of performing services for the lord of the manor) and 2 bordars (of lower status than a villain) and 1 plough on the desmesne and half a plough belonging to the men, and 5 bordars by the water (fishermen) who held no land. There were also sheep, rounceys (horses), cows and calves and it was worth 100 shillings. centuries. With its strategic position it protected the Thames from the Dutch, French and Spanish navies and the army used Leigh for the embarkation of thousands of troops to the continent. It was a fast route from London to Calais, which was British for several centuries. The mariners of Leigh were expert seamen, captains and admirals, and some became brethren of the Guild of Trinity House, founded in 1514 by Henry V111, whose area extended from the Port of London to the Crowstone. These included Richard Haddock, whose family provided ten captains and two admirals, who was knighted by Charles II, after the Battle of Sole Bay, and was made Commissioner of the Navy. There were other admirals and many captains who lived in Leigh, such as the Goodlads, Witakers, Salmons, Rogers and Bonners and many London merchants owned ships which were built in Leigh, and their masters and crews were Leigh men. William Camden (1551 -1623) the Elizabethan historian described Leigh as ‘a proper fine little towne and verie full of stout and adventurous sailers’. In 1588 ships were paid to keep watch for the Armada, and the Spanish Ambassador told Phillip of Spain that Leigh had built 31 vessels that could be armed. In the event a number of Leigh ships with Leigh masters went to fight or assist the English fleet against the Armada. In the Dutch wars of the 17th century Admiral Blake brought his damaged fleet to Leigh after losing a fight with the Dutch in the Medway. He then took his repaired fleet of 60 ships to beat them at Portland Bill. During the Napoleonic Wars at least one Leigh man appears to have been involved in the Nore Mutiny and may have sailed with Nelson’s fleet at Trafalgar. John Wesley came to Leigh on several occasions and founded the strong Methodist community which survives to this day. There was, and is, of course, the fishing industry which reached its peak in the 18th and 19th centuries, but Leigh’s significance as a port declined in the latter part of the 19th century as the deep water of Leigh Creek silted up. The oyster and shrimp trade became important in the 19th century. The Railway Company, later the London Tilbury and Southend line, literally cut the Old Town in half in the 1850s when over one half of the buildings were demolished and we lost many Tudor mansion houses, which after becoming bricked up, had became public houses and tenements. Leigh like many another town lost men during the Great War and the little fishing and cockling ships and their valiant volunteer crews of Leighmen went to Dunkirk in World War Two to help rescue the British Expeditionary Force from the beaches, some losing their lives at sea, as with the tragedy of the loss of the Renown. Illustrious the events and the main characters may be, but behind them all are the ordinary people of Leigh who through the centuries have plied their trades and made the town what it was and what the Leigh Society strives to preserve. The fishermen I came into contact with at Leigh were old men with no scholarship. They told me of their thoughts; the things they said within themselves as they sailed with the stars and with the wild waters about and beneath them. For sheer poetry I have never heard more beautiful things than fell from the lips of those unlettered men.